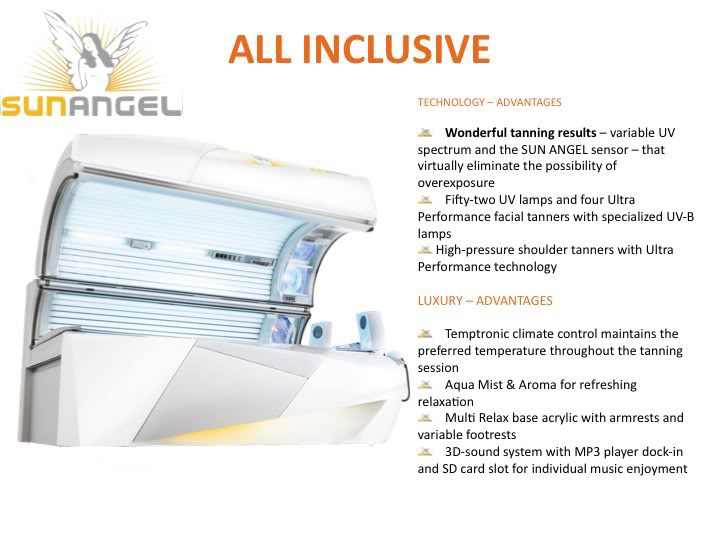 Blue Palm’s Sun Angel is the most advanced tanning machine ever introduced! Unlike the sun’s rays, the SUN ANGEL emits a custom UV spectrum. Intelligently blending UV-A and UV-B makes better use of the UV rays to give you that perfect tan, while virtually eliminating the possibility of overexposure. Three factors play a crucial role in the tanning performance that Blue Palm’s Sun Angel offers with its variable UV spectrum. Existing skin pigment tans more rapidly and the tanning effect happens sooner than it does on conventional sunbeds. In addition, the Sun Angel generates new pigment more rapidly. The twelve minute tanning session is optimized for maximum pigmentation. The skin’s own light resistance increases with each session and the UV dosage can be gradually increased for an attractive, long-lasting tan. Apart from a sumptuous tan, Blue Palm’s Sun Angel activates vitamin D3 synthesis, which the human body also produces when exposed to natural sunlight. The integrated Sun Angel sensor determines your skin’s sensitivity to UV light by using measurements from your face and body. The Sun Angel uses these results to calculate a specific and personal tanning session that emits the correct dose of UV light necessary for a great tan while virtually eliminating the possibility of a sunburn. No rushing you in & out like in most beds! Blue Palm’s Sun Angel includes relaxation features like digital 3-D surround sound with MP3 docking, the perfectly shaped lounge acrylic with built-in head support, the Temptronic climate control system and the Aqua Mist with aromatherapy. It’s an experience unlike anything you’ve ever had! Blue Palm is the only salon in the area with the Sun Angel Duo. Experience luxury for yourself, stop in today!